This is the first time that I have been aware of such features anywhere in the highlands or on other Scottish islands. 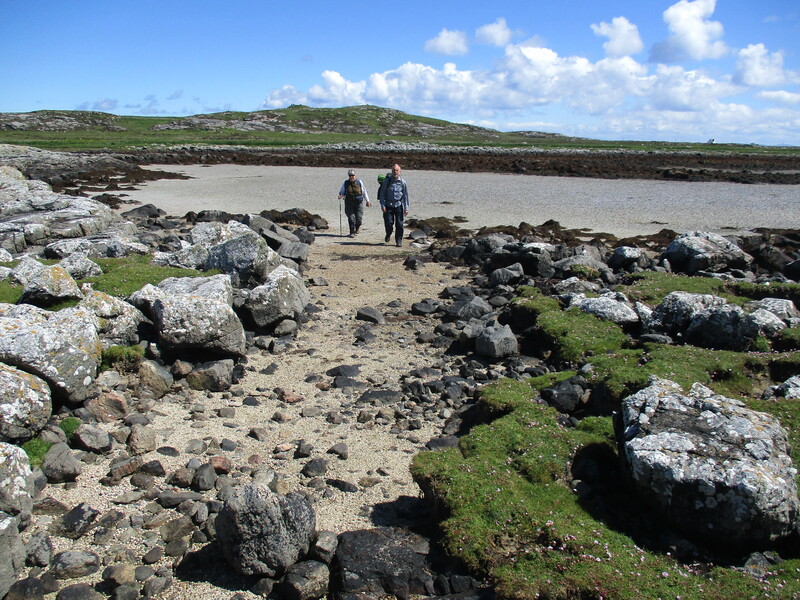 The Caolas track ways are all about 2m wide where stones have been shifted left and right through the intertidal boulder spreads and outcrops to avoid lengthy routes around the hags over the soft and fragile swards of the saltings on the high water mark. On the east side of Fadamull islet which is connected to the main island by a tombolo (a gravel bar covered at high tide) we found 7 cleared boat landing places most of which were connected to a naturally clear beach where boats could be pulled right up out of the water by a cleared track way that ran parallel to the shore. Otherwise the cleared landing places stopped short of the high tide mark – all rather strange as we don’t know what they were for. 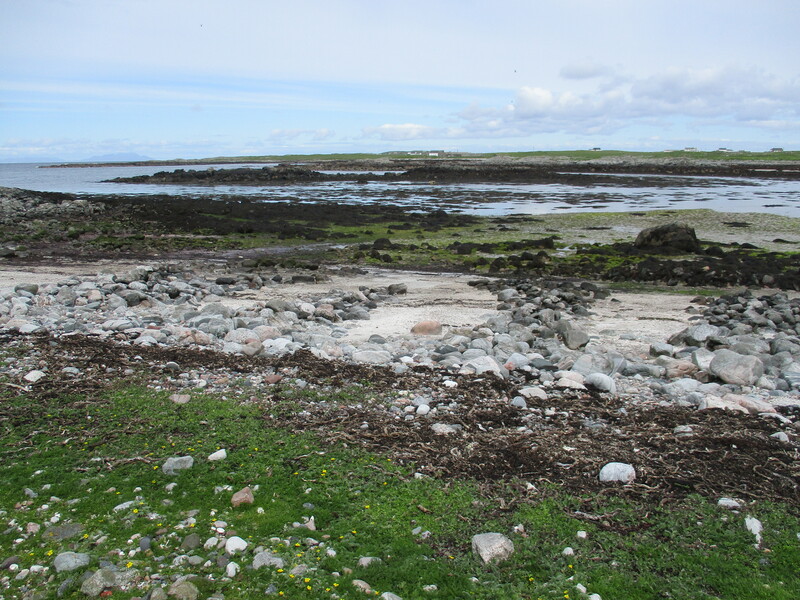 There are more than a dozen short lengths of seaweed drying walls on the islet but only one possible burning pit. Our thinking meantime is that the cleared landings were used to beach heavily laden small boats stacked to the gunwales with seaweed after which they were unloaded into carts or panniers using the intertidal track way off the sterns of the boats. Smart thinking as taking heavy wet seaweed off the sides of a small boat and staggering up a rocky beach with it would not have been very efficient. Whether this arrangement was purely associated with burning seaweed to produce kelp (soda ash) or for landing seaweed to be used as manure we don’t know. A bit of both maybe? Possibly also associated with the time when the iodine factory was functioning and calling for large supplies of seaweed. This entry was posted in General Archaeology, Inner Hebrides, Surveying and Recording and tagged archaeology 3d Model, Ben Hough, Caolas, cleared boat landings, Coastal Zone Assessment Survey, cup marked stones, drilled holes Milton harbour, Fadamull, Intertidal track way, John Holliday Tiree, kelp burning, kelp drying walls, kelp industry, kelp pits, Neolithic population of Tiree, North of Scotland Archaeological Society, photogrammetry cup marks, pink footed geese, ringing stone, SCAPE, sheiling huts, Tiree archaeology, Tiree gneiss, Tiree rock art, transhumance on June 30, 2017 by nosas.